Wild-caught Salmon with crushed pecans, breadcrumbs and maple vinaigrette. 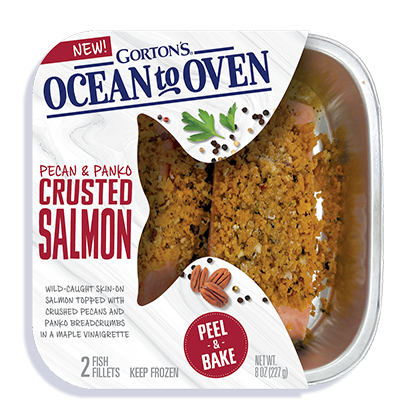 Ready for the oven when you are, just peel and bake in the oven-ready tray for the ocean-fresh flavor of wild-caught, skin-on Salmon paired with restaurant quality ingredients that make a homemade meal taste gourmet. 3. Place tray on middle rack of oven and COOK for 30 minutes. 4. CHECK FISH*. If not fully cooked, continue baking and check at 2-minute intervals until done. *FULLY COOKED FISH IS 145°F OR HIGHER AT THICKEST PART OF FILLET, FLAKES EASILY WITH FORK AND IS OPAQUE. INGREDIENTS: Salmon, wheat flour, maple syrup, pecans, apple cider vinegar, less than 2% of: canola oil, olive oil, water, salt, garlic puree, dehydrated roasted garlic, yellow corn flour, corn starch, sugar, spices, yeast, caramel color, parsley, xanthan gum, citric acid, paprika extract (color). Produced in a facility that processes egg, milk and shellfish.